Take a tour of the Morača Hall, one of Montenegro’s finest sporting venues. The Morača Hall is a temple of Montenegrian sport. With a capacity of 4,500, it is the largest hall in the country. For years the Morača Hall has played a major part in the success of Budućnost’s handball team and the atmosphere created by home fans is famous all over Europe, regularly providing the ‘eighth player’. Many international games have been played in this hall, in all sports. Besides EHF Women's Champions League games and qualifications for European Championship, Morača Hall hosted the of 2010 Men's youth European Championship. And in August of this year the hall will host the Women's Youth World Championship. The hall is located in the new part of Podgorica, five to ten minutes walk from the center of the city, ten minutes by car from the bus and train station, on the right bank of the Morača river (one of five rivers in Podgorica), which gave its name to the hall. Construction began in 1978, and it is one of several sports facilities scattered across a five-hectare area. It hosted six preliminary round games of EuroBasket 2005. For this occasion, the venue underwent major refurbishment to meet the standards imposed by FIBA. With the immense growth in the popularity of water polo (especially after Montenegro became European Champion in 2008) two brand new open air swimming pools were added to the facility in 2009, which hosted the 2009 FINA Water Polo World League. Morača sports center also includes a restaurant with 160 seats, café with 180 seats, summer garden and a large terrace. To the west of the hall is a car park, with about 200 parking spaces and 5-6 additional places for buses. Behind the hall there is an additional 100 parking spaces. Near to Morača Hall there is the four-star hotel “Podgorica”, known as a unique architectural work situated in the natural environment of the river Morača, and close to Old Podgorica and the urban centre of the capital. And a few hundred metres from the hall there is another four-star hotel, the City Hotel. 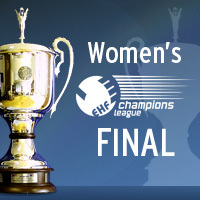 Watch both legs of the EHF Women's Champions League Final on ehfTV.com (subject to local restrictions). Click HERE for more information.